Image taken from Algerian TV network Ennahar shows body bags of victims placed near the scene after a military plane which crashed soon after takeoff from Boufarik military base, near the Algerian capital, April 11, 2018. 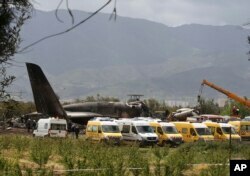 Algerian media is reporting that over 250 passengers were killed when an Ilyushin 76 transport plane crashed in fields near a military base outside the Algerian capital Algiers. Eyewitnesses say they heard an explosion before seeing the plane crash and burn in nearby fields. Algerian TV showed video of the military transport plane burning on the ground, as plumes of white and black smoke billowed into the air and flames licked the sides of the plane's fuselage. Dozens of ambulances could be seen in the field where the plane crashed. A nearby resident said he rushed outdoors to see what was happening after hearing an explosion around breakfast time. He said that he was indoors when he heard the explosion, including a big bang, and then he saw thick plumes of smoke when he went to see what was happening. Firefighters and civil security officers work at the scene of a fatal military plane crash in Boufarik, near the Algerian capital, Algiers, Apr. 11, 2018. It was a real catastrophe, he added, and everyone was afraid there would be more explosions. He said young men were coming to take pictures of the crash. He said he called the police and civil defense forces. Another man explained that he and others were not able to get close to the crash after the police arrived. He said the plane was taking off from the Boufariq military base when it crashed. He said firefighters came quickly to try to put out the fire and that bodies were scattered all around the debris. B he said he wasn't actually able to get near the wreckage. Other eyewitnesses who saw the crash from a nearby highway told Algerian TV the pilot appeared to have a technical problem before veering off to the right and crashing in a field. "The pilot had the presence of mind to veer off to the side so as not to hit the highway during morning rush hour," one witness said. A young man by the name of Sadeq, who lost his brother in the crash, cried as he spoke with journalists. He said his brother called him before he left on the plane that crashed and told him that he missed him and wished him well. Air safety analyst Mohammed Ben Zarouk told Algeria's An Nahar TV the plane was heading to the far-off region of Tindouf and then to Boushar. He said the pilot had "no doubt filled up his fuel tanks to maximum capacity." Other analysts indicated that the Russian-built Ilyushin 78 transport plane was originally designed to fuel fighter jets in the air. Algerian air defense head Baqoush Allash told journalists there would be an investigation into the crash as well as an investigation of Ilyushin 78 planes. This report was written by Edward Yeranian in Cairo.